What a riveting life I lead, huh? Since I eat so many of them, I usually make my own dressings too. Whatever’s in season or whatever floats my boat is what I throw in any and all salads. I think I learned this from my mother-in-law, who makes the best salads EVER. 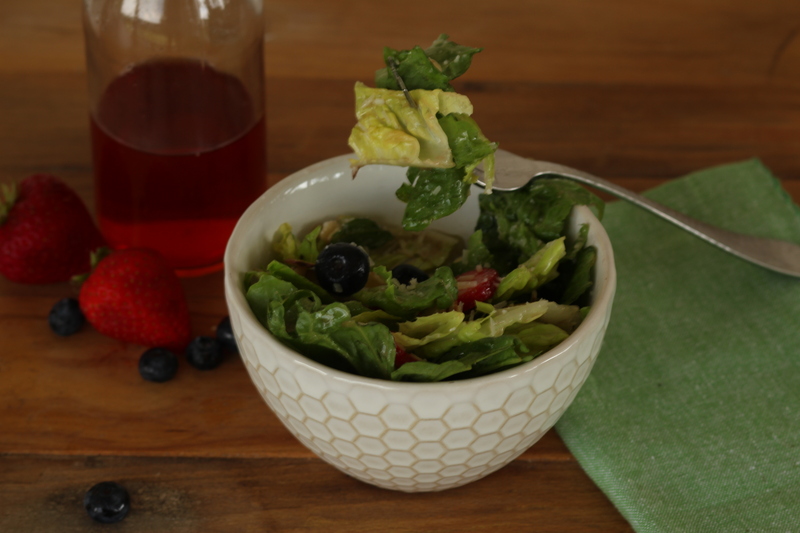 She puts all kinds of fruits, nuts, seeds and assorted vegetables in her salads. In fact, sometimes there’s such a variety of things in them, my daughter calls them “kitchen sink” salads. Although it might sound unkind, she means it in a good way – really. I would never think to add feta cheese and pumpkin seeds, beets and golden raisins, etc… as ingredients in a salad, but she does, and somehow it’s incredibly amazing. That’s just one example, too. She also makes her own salad dressings, so maybe I’ve learned it through osmosis or something. Combine all ingredients, mix thoroughly. Makes just under 1/2 C.
How do I kick it up though? For starters, I often use Jane’s Krazy Mixed-Up Salt or Trader Joe’s Everyday Seasoning instead of just salt & pepper. They both have other ingredients like parsley flakes, onion flakes, garlic and other spices that up the taste factor just a bit. I don’t always add the mustard. It’s about 50/50; just depends on my mood. I substitute other acids for the lemon juice. Fresh lime juice or orange juice can change the taste in a big way. If I’m going for a Caribbean jerk flavor, lime juice is the way to go. If I’m going for an Asian thing, orange juice adds just the right amount of sweetness and tang. But the biggest way I change it up is the vinegar. I don’t always use the dark balsamic vinegar. I substitute the white balsamic A LOT, but I also use regular white vinegar, champagne vinegar, apple cider vinegar and…. fruit infused vinegars that I make myself. 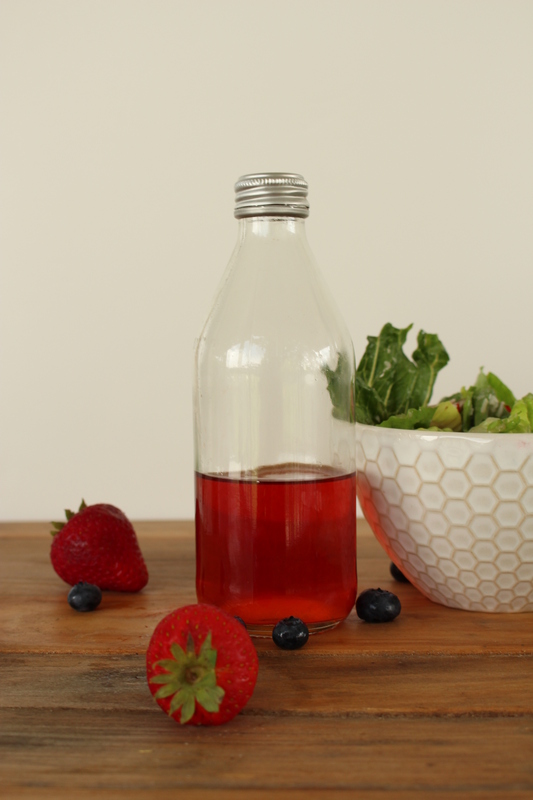 I used to buy them, but then I saw someone use the leftover tops of strawberries to make a strawberry vinegar. “I can make that myself,” I thought. Instead of buying a fig dark balsamic, why not make my own? Delicious. by the way! It’s super duper easy to make your own. 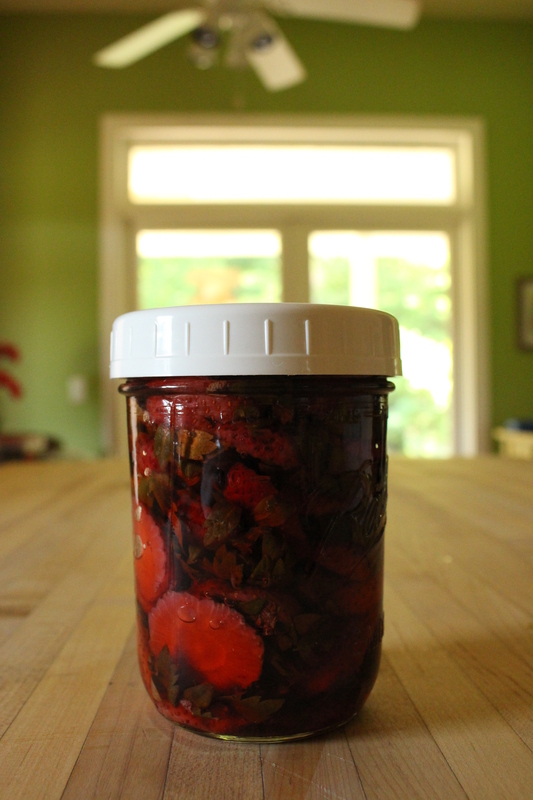 You just fill a mason jar with fruit of some kind, and then fill it up to the top with your chosen kind of vinegar. For darker fruits like figs or pomegranates, a regular balsamic works just fine, although, if a fruit has a lovely color, I like to use a lighter-colored vinegar. I’m a big fan of Trader Joe’s White Balsamic vinegar, because: a) it’s Trader Joe’s, b) because it’s Trader Joe’s they keep it in stock and c) because it’s Trader Joe’s it’s tastes decent and is inexpensive too. Above I’ve just poured the vinegar over the strawberry tops, and below after a few days you can see the vinegar is starting to take on a very slight reddish color. 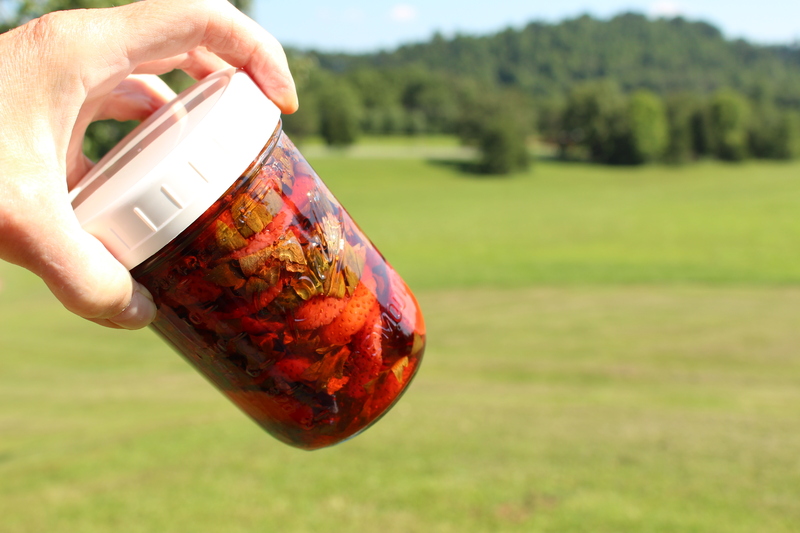 It usually doesn’t take more than 5 to 7 days for the vinegar to be infused with both a nice color and flavor. 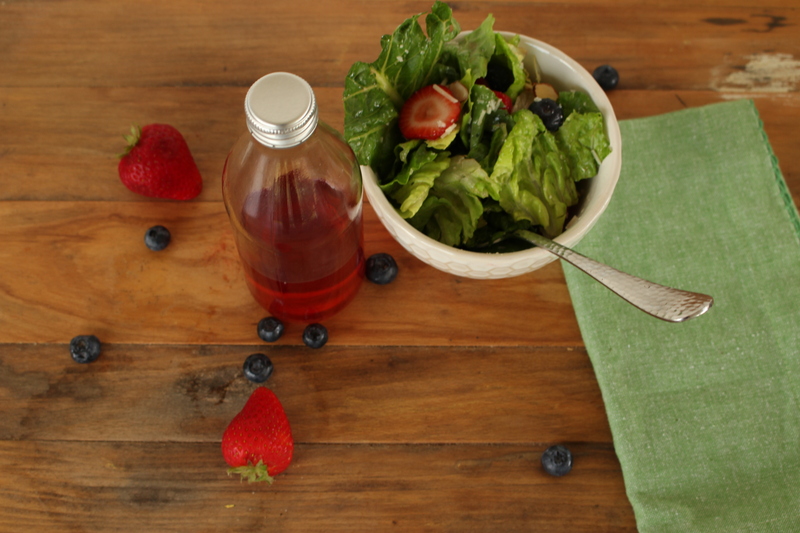 After a few days, you have a bright, fruit-infused vinegar that amps up your salads just the teeniest bit. And people will ask you what salad dressing you’re using. Or if you made it yourself. Because it makes just the right amount of difference people that can’t put a finger on it. Isn’t it pretty? Once it’s actually made into a dressing, it loses a little of its color, but it tastes delicious! Which in my mind, matters a LOT! Try it one of these days. Let me know what you think. Because I think you’ll really like the extra “ummph” it delivers to your salads!